This is a little feature in Articulate 360 but could of use to so many users out there. Especially those who use go animate video scribe, and powtoons. Any Peek video you upload can be downloaded as a scorm and you can set what percentage complete the video needs to be! But even better you can upload any video and download the same way, this is so cool! It means the end of me putting videos into Storyline as a Scorm wrapper! Also it is more accurate than doing that because you have a percentage complete option! Thanks Articulate! Great point Phil! I'm impressed with how well our product team has implemented this feature. Have used this several times already. Really handy. Add a caption upload feature and a CC player feature and it'll be perfect! So excited to try the feature out!! thank you 360!! I agree, this is just a great feature! Hi Phil, I couldn't see how to upload "any video" in Peek. Are you referring to Review? Yes you need to upload the video in review, sorry I found the feature in peek. Thanks Phil for the info! I just tried this out; uploaded some video to Review, exported as SCORM 2004 with 80%completion, downloaded, uploaded to SCORM cloud and ran the video. The reporting works. The only issue is that you can fastforward the video, I completed a 20 min. vid in 1 min and still got my passed status. The fast forward feature is a big problem for me on mobile as well. There has to be some way to get users to watch the videos. Have you looked into the reason why they aren't watching the videos? They would rather skip the video and guess the answers while taking the quiz. They are not currently being held accountable. The reality is that not everyone has an intrinsic desire to learn and they do not see the value in watching them. Even though they are actually spending more time retaking quizzes. I do not own the videos in question. I have nothing to do with their production or implementation. Not sure if this will work with your content or LMS but something I have seen is cutting video into short clips (say 30 seconds) and using them as a pick many quizzes. So they have to watch 3-4 short videos then pick which one was the correct method. These videos are mainly for monthly menu specials. The videos introduce the food items and then walk the viewer through the steps to prepare them. I've been auditing our files and some of them run up to 9 minutes long, which is part of the problem. Our solution for our current video is to have the chef say a key word or phrase at a random place in the video but, I think we can do better overall. I do like your suggestion though for some of our other videos. Ah, neat feature (Easter Egg) Phil! Hoping to see some player updates for the videos published from Review. Really like the player that was used in Adam's Rise demo. Add in closed captioning and the player would rock. wow, that is an awesome find Phil, nice! Really like the player that was used in Adam's Rise demo. Not sure I saw that, do you have a link? 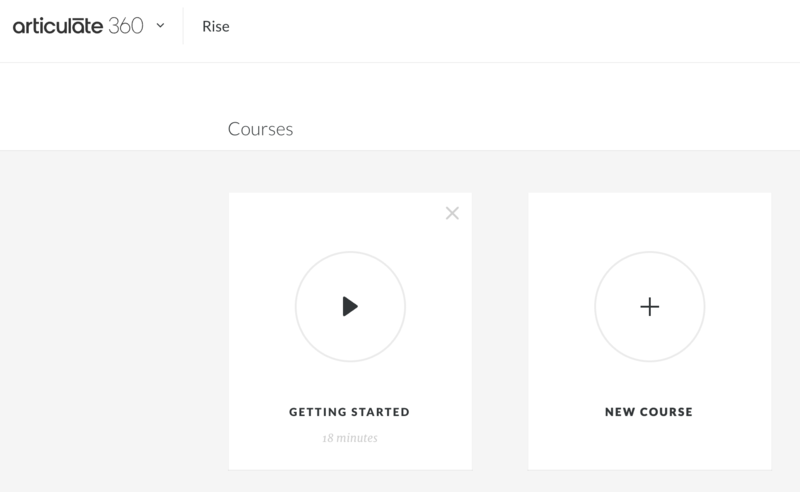 Not sure if Steve means the demo Rise course that's in the "Getting Started" video/link within Rise - that was automatically populated for everyone within the Rise page in Articulate 360. Do you not see that there? Anyone else having issues utilizing the function that Phil originally commented on with Internet Explorer? I was able to upload the video to Review, publish as SCORM 1.2, and load to LMS. The file won't play when launched via the LMS in IE, but works fine in Chrome and Firefox. Company standard browser is IE and must get special approval to use other browser on individual basis, so just telling uses to use browser other than IE is not an option. Thanks! I have a module that I've uploaded that I just tested in IE11 and Edge. What version of IE are you testing in on your end? One thing that might be monkey-wrenching the works is enterprise mode or compatibility mode. It looks like the video uses the video tag. This isn't supported in older versions of IE. Some LMS products, like CSOD, allow you to tell the system whether or not to use compatibility mode. In CSOD, for example, if you set the content to IE7/8/9 compatibility then no modern browser features will work. It'll make IE behave like an ancient, useless, security hole ridden, piece of technology. If you're using a newer version of IE, you might want to check into the way the LMS is serving up the content. Using IE11. Interesting insight in to the LMS side. I'll have to check with the HRIS team that support the LMS. Thanks! If you Right-click in the player window once the video popup is generated (or however it's launched) you can choose Inspect then Emulation. If the browser is in compatibility mode, you should see something like IE7 / IE8 in the User Agent string. If it says Microsoft Edge, the LMS isn't likely the problem. If it's something older, the LMS or a local policy are kicking you into compatibility mode. "Have used this several times already. Really handy. Add a caption u..."
"Would be a good feature request to be able to lock the play head ..."
"Hoping to see some player updates for the videos published from Rev..."